Here are some interesting pictures from the drive home from Chicago to Oakland. 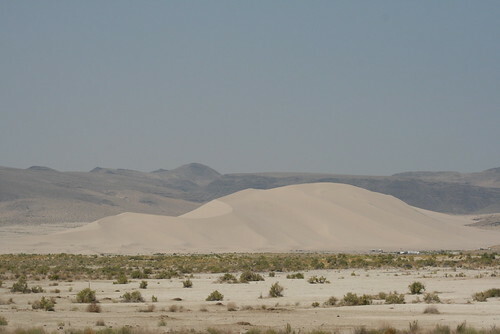 As we were driving through Nevada on Hwy 50 (the only state that we actually took pictures in during the roadtrip) we came across a huge sand dune in the middle of the mountainous Great Basin Desert. We decided to drive towards it, and it just kept getting bigger and bigger. In the picture, you can see some tiny white things along the bottom of the dune to the right. Those are RVs and other trailers camping out next to the base of the dune! Also while driving down Hwy 50 (which has been nick named the Loneliest Highway in America) we came across a strange tree. From far away, it didn't look right. It looked a little 'clumpy.' 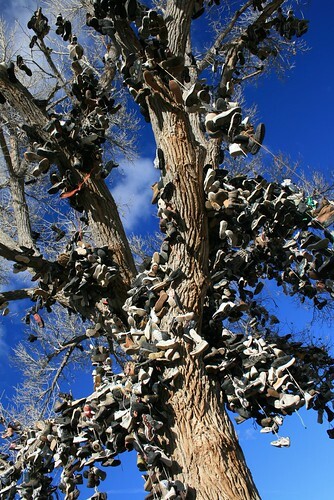 As we got closer, we discovered that there were a bunch of shoes hanging off the the cottonwood. It was a very strange collection of shoes, some that looked brand new, others that looked from the 70s. 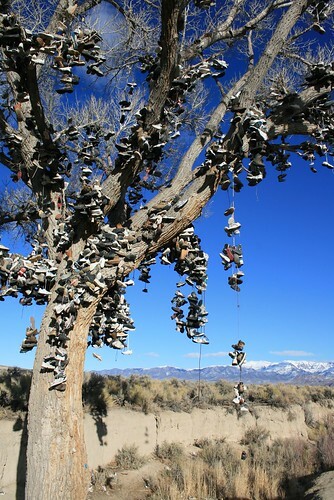 If we had some junky shoes, I guess we would've strung them on too! The mountains in the background have snow on them. Most of the mountains in Nevada had snow while we were driving. In fact, most of the road was covered in ice or snow, and it was pretty cold for being a 'desert.' Although once we got to the western part of Nevada (where that giant sand dune was) it started warming up and the snow disappeared. Some branches fell off the tree. I am assuming it was because of the weight of all those shoes! I guess there is nothing else in the middle of the desert to do. 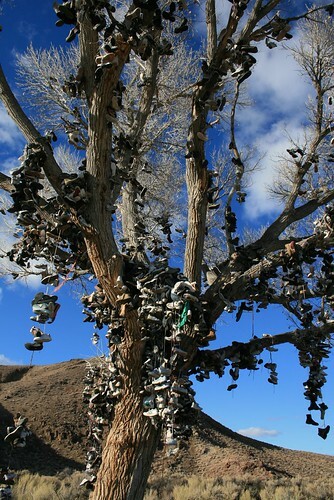 As strange as this is, we actually saw another shoe tree later on somewhere in the Mojave Desert in California. . .